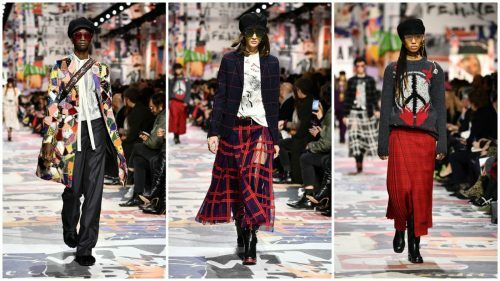 For fall & winter 2018, Dior‘s artistic director — and an unapologetic feminist — Maria Grazia Chiuri looked for inspiration in the disorderly 1960s, taking advantage of a venue plastered with colorful collage-like images of fashion magazines from the decade. The show illustration cited the 50th anniversary of 1968 particularly as an opportunity to “revive an era when the rules of fashion were turned on their head,” as well as the September 1966 picketing of a Dior boutique by miniskirt-wearing protesters whose signs read, “Mini Skirts Forever,” and Diana Vreeland’s coining of the word “Youthquake” in January 1965. Actually it comes as no surprise, that patch-worked pieces were the stars of Dior fall & winter runway collection, showing in roomy high-waisted trousers, colorful patch-worked knee-length coats, dresses with delicate lace collars paired with wide leather belts sporting chunky “D” belt buckles as well as knee-high boots and backpacks, most with vagarious feather-stitch embroidery over top. 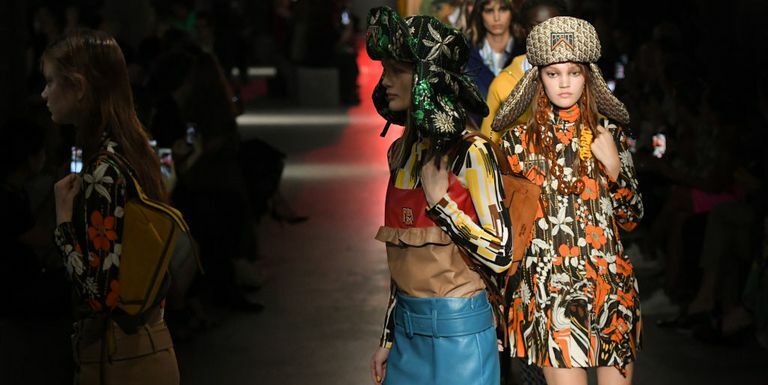 More patchwork, or patchwork patterns at least, turned up in a range of denim pieces including high-waisted trousers and coats. From previous collections, Versions of the sheer tulle tops made an appearance; the latest ones embellished with shoulder pads WHICH ARE decorated with needlepoint-like designs. And tulle skirts came embroidered with floral vines or in plaid patterns which were paired with leather biker jackets or plaid menswear-inspired jackets. 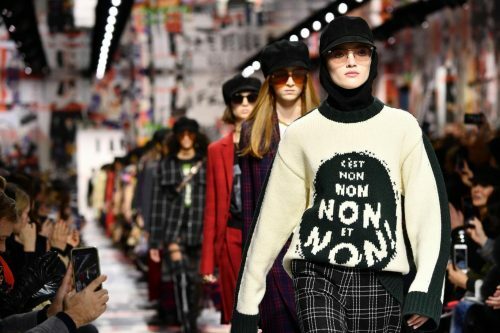 With intarsia knit protest-chic designs, Slouchy sweaters were sprinkled throughout, including the French slogan and a peace sign on one, “C’est non, non, non et non!” on another (meaning: “It’s no, no, no and no!”), and plenty of looks were given an extra dash of retro flair thanks to tinted sunnies, suede newsboy caps and strappy bags with metalwork detail and woven fringe. On the Saint Laurent runway for fall, some of last season’s shivering feather-festooned footwear was back, but the statement kicks which caught our eyes coming down the catwalk this time were benevolently fur-trimmed black boots that had a swashbuckling lady pirate feel to them — a feeling that was heightened further when the models were also accessorized in black, silver-studded do-rags and fierce kohl-rimmed eyes.